I am busy finishing off our adventures in Vietnam for everyone to read. Soon we will update you on our travels through Hong Kong; with plans for Taiwan and China on our list of destinations in the next month. Happy reading. Thanks for all the wonderful comments – keep them coming! Hi Karina – it is 2 am here. I ‘ve finished a heap of work and thought catching up on your website would be a good reward. Love the pictures of Vietnam. I had no idea it was such a great place to visit. Maybe one of these days….. Anyway all is good here. Little Mick is a walking maniac. Here, there, everywhere. I know exactly when he is close to Erin by her screams – as he pulls madly at her hair. She is yet to learn to move away from his little fingers. Aah! Don’t forget it is Mother’s day on the 8th May. Make sure you do something nice. Sounds like you guys are making a name for yourselves. 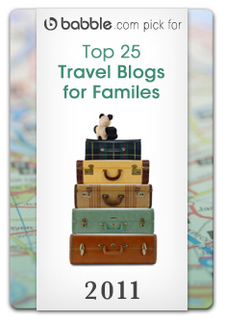 #2 on the Family Travel blog! If you get to be #1, does that mean you get free trav./Accom. to host a G’ma and G’pa free in your baggage so they can afford to se the world with you? Love you All. Keep safe. Congratulations! I do love your blog. It is a great read!